Please welcome K.E. Mills to The Qwillery. Wizard Undercover, the 4th novel in K.E. 's Rogue Agent series, was published on May 1, 2012. K.E. : Unless panic stations demand otherwise, I write in a windowless room with one small lamp and low soundtrack music playing. I need to be in a kind of sensory deprivation cocoon, or else I go nuts with distractions. K.E. : Both. The intricacy of the pre-plotting is dictated by the complexity of the story. So for the current project I've got maps, visual references, paintings, photos -- and a fairly comprehensive idea of the main events of bk 1. But I also need to leave lots of blank space so I've got somewhere to play during the journey from idea to execution. Otherwise my brain doesn't start firing. For me, the discovery as you write is the most exciting part of the process. If I over-plot ahead of the writing process, I kill the spark. TQ: What inspired you to write the Rogue Agent series? K.E. : Honestly, I don't know. All I can tell you is that one day a few years ago I sat up in bed out of a sound sleep and said to the dog, I have to write a story about a wizard named Gerald and his best friend, Reg, who's a witch who got turned into a bird. Seriously. And the ball started rolling from there. TQ: What sort of research did you do for the series? K.E. : My research is always ongoing, no matter what I'm writing. In general, I read up and watch dvds on the late Victorian/Early Edwardian period in Britain, which is the 'real world' inspiration for the culture/society of the Rogue Agent series. Then if I need to, I do specific research - about airships, for example, which feature in Witches Inc.
TQ: Describe Wizard Undercover (Rogue Agent 4) in 140 characters or less. K.E. : Gerald must prevent the sabotage of an important international marriage. To succeed, he goes undercover with Bibbie as Melissande's attendants - and mayhem ensues. TQ: Tell us something about Wizard Undercover that is not in the book description. K.E. : Monk and Reg get to spend some quality time together - which threatens to turn Monk grey before his time. TQ: In Wizard Undercover, who was the easiest character to write and why? Hardest and why? K.E. : Honestly? This time around every single character was a gift to play with. But, as usual, it's Reg who leaps out of me with the greatest ease. She's the most fun ever, I just sit back and take dictation when she's on stage. TQ: Without giving anything away, what is/are your favorite scene(s) in Wizard Undercover? K.E. : All of the scenes between Monk and Reg - especially the one where she's questioning his mission-planning abilities. And all of the scenes between Sir Alec and Dalby. I love the relationship between those two. TQ: Which character from the four Rogue Agent novels has surprised you the most? K.E. : Emmerabiblia. There are some twists with her character in this book that I wasn't expecting. But as the story unfolded, they become inevitable, really. I think she's going to be even more fun to play with in the future. 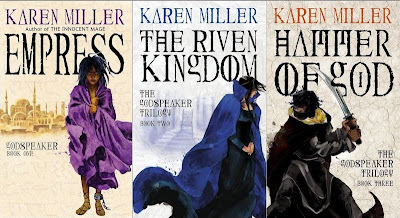 TQ: You also write the Kingmaker, Kingbreaker series (as Karen Miller). 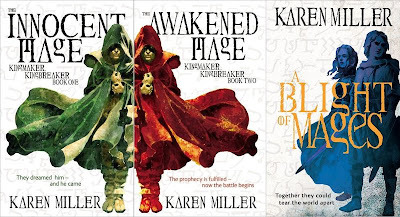 Are there any themes that you explore in both the Rogue Agent series and the Kingmaker, Kingbreaker series? How are the series different? K.E. 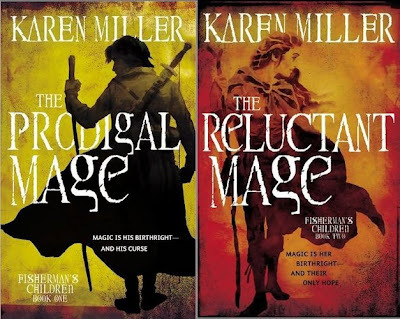 : Well, to take the last question first -- while at the end of the day I always write drama, the Rogue Agent series definitely has a seam of lightness running through it that you won't find in the epic historical fantasies I write as Karen Miller. And that's purely a function of the characters -- their dynamics, their relationships, just lend themselves to what I call situational humour. It's not comedy, where the purpose of the characters is to drive the humour. In this case, the humour arises out of the characters and the situations in which they find themselves. I think it also makes a difference that this is a series - you can build in long-running jokes and references into a series that adds to the humour, which is a part of life. 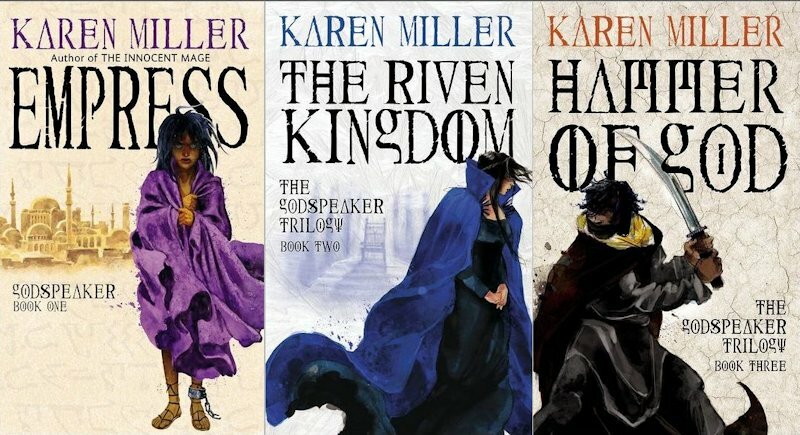 But even though the Rogue Agent series has humour threaded through it, and my work as Karen Miller tends to be more serious -- the Mage quartet, the Godspeaker trilogy, even the work I've done in the Star Wars and Stargate worlds -- as I say, at the end of the day I write drama. And for me, one of the enduring themes of interest you can explore in fantasy is the use and abuse of power - be it personal or political. How that manifests itself depends on the individual story, but it's an over-riding theme in all my work. Another theme would be the challenge of living honourably in a world that rewards dishonour. Friendship, and what a difference it can make. I think these themes run through everything I write, no matter which name I'm using. K.E. : Next is a new epic fantasy series called The Tarnished Crown. It's the biggest, most frightening thing I've ever attempted. Huge canvas, lots of characters, high stakes, and pirates. I'm writing the first book now, and it releases next year. 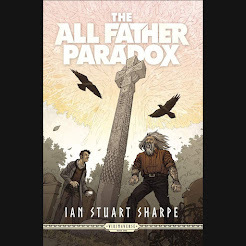 And then there's the next adventure in the Rogue Agent series, also out next year. That one's got a basic plot organised, and I'm really looking forward to it. There are some big things ahead for our friend Gerald! K.E. : Thank you so much for asking me! It's been great. Wedding bells are ringing for the constantly battling nations of Splotze and Borovnik, and the upcoming royal nuptials could at last put an end to their dangerous hostilities. But in a development that hardly bodes well, one of Gerald's fellow janitors goes missing - after delivering a dire warning of danger surrounding the marriage treaty. So Gerald must embark on a dangerous mission to uncover the troublemakers, before wedded bliss becomes international war. But going undercover isn't as easy as it looks, even with Melissande and Emmerabiblia for camouflage. Soon Gerald finds himself fighting for his life as well as world peace. When the staff of Witches Incorporated receive a visitor from an alternate reality, they are shocked to learn that life in the parallel world next door is anything but a bed of roses ... and it's all because of Gerald Dunwoody. At a crucial moment in time, their Gerald turned left ... but the alternate reality Gerald turned right. Now the parallel world next door is in the grip of terror, staring down the barrel of a thaumaturgical war -- a war that threatens to spill across the dimensions and plunge every reality into a nightmare. The only person who can stop a rogue wizard gone mad is another rogue wizard. But what do you do when another rogue wizard can't be found? And it's also Gerald's first official government assignment. He's hunting down a deadly saboteur, and time is quickly running out. Old enemies and new combine forces to thwart him. Once again, innocent lives are on the line. He needs his friends. He can't do this alone. But Princess Melissande and Reg have troubles of their own. With the help of Monk Markham's brilliant, beautiful sister, they've opened a one-stop-shop witching locum agency, where magical problems are solved for a price. Problem is, the girls are struggling to keep the business afloat. Things are looking grim for Witches Incorporated - and that's before they accidentally cross paths with Gerald's saboteur. Gerald Dunwoody is a wizard. Just not a particularly good one. He's blown up a factory, lost his job, and there's a chance that he's not really a Third Grade wizard after all. So it's off to New Ottosland to be the new Court Wizard for King Lional. Karen Miller was born in Vancouver, Canada, and raised in Australia where she lives today. Before she realised her dream of becoming a professional writer, she studied for and was awarded a Bachelor of Arts (Communications) degree and a Master of Arts in Children’s Literature, and worked in a wide variety of jobs, including: horse groom, college lecturer, PR officer in local government, publishing assistant, and owned a specialist science fiction, fantasy and mystery book shop. 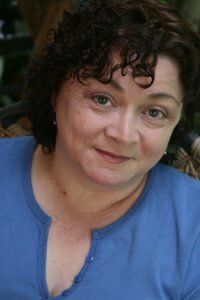 She has been writing professionally since 2005, and since the publication of her first fantasy novel ‘The Innocent Mage’ has written 17 novels. 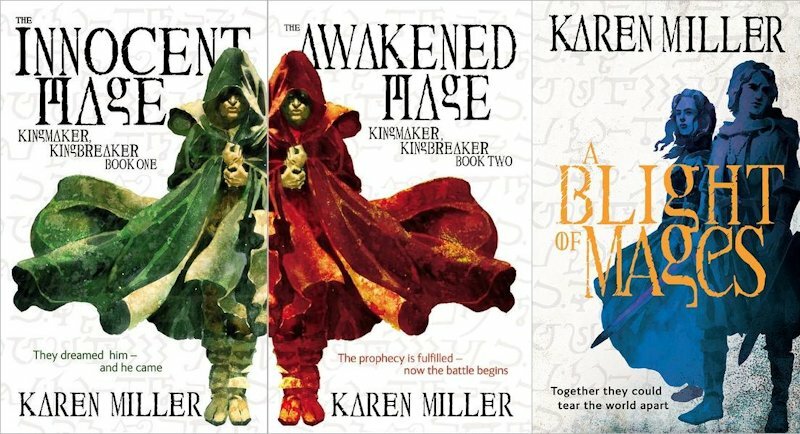 They cover epic historical fantasy, media tie-in work for Star Wars and Stargate SG-1, and the Rogue Agent fantasy series under her pen name K E Mills. Her work has been shortlisted for the James Tiptree Jr award and the Aurealis Award. When she’s not busy at the computer, Karen enjoys acting and directing at her local theatre company. What: One commenter will win his/her choice of one of the Rogue Agent novels - The Accidental Sorcerer, Witches Incorporated, Wizard Squared, or Wizard Undercover - from The Qwillery. Who is/are your favorite wizard(s), witch(es) OR socerer(s)? You can list one or many! Who and When: The contest is open to all humans on the planet earth with a mailing address. 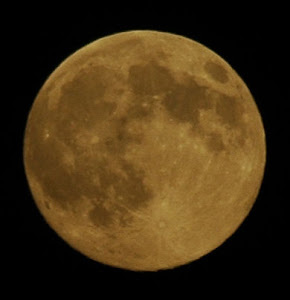 Contest ends at 11:59pm US Eastern Time on Thursday, May 17, 2012. Void where prohibited by law. No purchase necessary. You must be 18 years old or older to enter. My favorite wizard is Harry Dresden of Jim Butcher's Dresden Files book series. My favorite witch is Rachel Morgan of Kim Harrison's Hollow series. I've never read this author before so fingers crossed in good luck for this giveaway. Thanks! I like Tamsin from Once A Witch, Harry Dresdon from the Dresdin Files, Miranda in the Shadowfalls series, Rachel Morgan in the Hollows series, and Savannah in the Women of the Otherworld series. Aside from your books, I'm particularly fond of the Lancre witches from Discworld, Granny Weatherwax, Magrat and Nanny Ogg as well as the down to earth modern day witch Adriel from Schneider's Moon Shadow series. Also a Quillery follower, April V.
My favorite witch is Rachel Morgan of Kim Harrison's Hollow series! She tries so hard and doesn't always get it right which shows her as being human and real. Another vote here for Harry Dresden. I just love The Dresden Files. Thanks for the giveaway! Ok... I loved Dumbledore and Harry. Close second is Rachel Morgan of Kim Harrison's Hollow series. Harry Dresden from the Dresden Files and Rachel Morgan from the Hollows series. 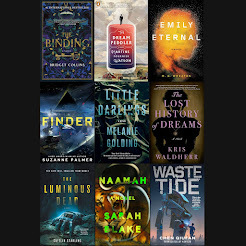 Well, Harry Dresden has to be at the top of the list, but I also like Kim Harrison's Rachel Morgan, and one I've recently discovered - Jenn Bennett's Arcadia Bell. There was Pug from Raymond E. Feist's Magician - the 1st 3 books were really good! Sonea from Trudi Canavan's Black Magician trilogy. Harry Dresden (Jim Butcher), Alex Craft (Kalayna Price), Arcadia Bell (Jenn Bennett)and Persephone Alcmedi (Linda Robertson) are all fun witches to read. I have not read any K.E Mills witch stories but I am adding them to my TBR list - they look great. My favorite witch of the moment is Max from Diana Pharoah Francis's Horngate Witches series. I like Harry Potter but I also like Harry Dresden. Harry Potter is my favorite wizard. Thanks so much for this! They were great questions, I had heaps of fun answering, and whoever wins the prize ... I hope you enjoy! Also? I'm a nong. There are 5 Mage books, not 4. Sigh. Karen Miller, aka K E Mills. I love the entire teaching staff in HARRY POTTER. All so individual & Quirky. I really like Hermione as a witch, but the other characters from the Harry Potter series are also a good load of fun. Besides them, Rachel Morgan and Harry Dresden easily make it to the top of my list. Thank you for this awesome giveaway and interview! Eep! I had no idea K.E. and Karen were the same author! I've loved soooo many of these books! Except for some reason I never read Wizard Squared, so I have some catching up to do before this one! Fave witch? Rachel Morgan. Fave wizard? Harry Dresden. Fave sorcerer? Ummm... I can't think of who I read *is* a sorcerer... Gimme a hint? ;) j/k! My favorite wizard is Harry Potter. As many posters stated, Harry Dresden is my favorite wizard, too. As a matter of fact, I'm reading Summer Knight right now!